“This series focuses on students gaining hands-on experience and pursuing their goals,” stated Tamarah Cook, manger of social media at SIU. Tamarah added that this series directly supports SIU’s overall branding messages. “Big Things Are Within Reach” videos are created and produced by students on the Social Media Team. Awesome! Giving capable students a project like this is really smart. They’re in touch with the current student body, have the ability to easily find these unique stories, and the end result will often look more authentic. If you aren’t required to have a three to five second intro of your institution’s logo, get rid of it. You can always put your logo at the end of the video or add a small watermark over your frames in the beginning. The first five to ten seconds are critical to retaining your viewers. In some ways I consider those intro-logos to be a punishment! I love the b-roll and effects selected for the beginning of the video. Making it clear very quickly that Nina’s story is unique and taking place outside the typical academic setting was a smart decision. As a viewer, I’m curious to see and hear more. The shots of Nina in action are interesting and fun. Filming the interview from her DJ chair enhances the story and provides authenticity. Smart visual choices! When you’re profiling current students with web video it is really important to select people who will be natural and relatable in front of the camera. Nina was a great choice. Layering music or other audio underneath a person speaking is a common practice, but you have to be really careful to not distract viewers from what is being said. The music was well selected for Nina’s video profile, but overall it needs to be toned down. Many video editors will auto-adjust layered tracks for you, known as “ducking.” Make sure you manually re-adjust if necessary. In fact, you might have to reduce the volume of your layered tracks to different levels throughout the video depending on how loudly the person on camera is speaking. Once you have all the audio tracks properly layered and adjusted, always give the entire video one final listen, with you eyes closed. It’s amazing what you might pick up when you remove the sense of sight and just focus on listening. It’s important to select your visual effects wisely. Too many transitions, flashes, or filters can be a bit overwhelming. More could have been done with the description and tags. What if a student wants to take Nina’s path? What is the next step? Why not provide a link to her major’s academic page? And better tagging will increase the likelihood that other videos from this series will appear in the side column of related videos. In case a prospective student discovers these type of videos on your YouTube channel, create YouTube playlists for your video series when two or more videos are posted. In case a prospective student randomly stumbles across this video, don’t make it difficult for them to discover the rest. Using YouTube annotations you can quickly and easily link to the rest of the videos in your series. This video fits well into the theme “Big Things Are Within Reach.” And Nina is a great example of a SIUC student pursuing special opportunities. The video has received a modest number of views. Selecting a title for the series that is in line with other branding efforts allows SIUC to take advantage of SEO opportunities. For example, notice the first sentence on the how to apply page. My rating for this video is a 7.5. The video series is a fantastic idea to enhance the “Big Things” tagline and profiling Nina was a smart decision. I took into account that this series is student created and produced, but there were some audio issues and other minor details that prevented me from giving the video a higher score. Overall, it is an interesting and enjoyable video to watch. Thanks for sharing this series, Tamarah! Don’t forget to submit a video from your institution. As you can probably tell from my title, I am rarely impressed with holiday cards from higher education institutions. More often than not I find them to be forced, too long, boring, etc. There are a couple video holiday cards this season that I’ve been particularly impressed with. The College of William & Mary and Wofford College produced amazing video holiday cards. Both focus on the talents of current students (Wofford actually wrote their own holiday song!) and they are very well produced. I often think we try to do too much with video. Let one concept shine through and you’re golden. That is why I like these two examples in particular. They keep it simple. They focus on the cheer that a holiday song will bring viewers. They are the perfect length. My alma mater and former employer, Saint Michael’s College, produced their very first video holiday card this year. And to my happy surprise, I love it. The music featured in the video is from the Sleepless Knights, one of the acapella groups on campus. Featuring students is important to higher education video engagement. And it saves you from violating any copyright laws. The theme of the holiday card is “giving back at Christmastime.” They are able to execute this theme in a way that engages the viewers and sprinkles in some good ole’ cheesy-humor. St. Mike’s is a catholic institution and the founders, the Edmundites, are known for their generosity and giving back to the community. They didn’t produce a video holiday card to be like all the other institutions out there. This theme was well thought out and relevant for the institution. Three cheers for being mission-driven AND entertaining. The mascot, Mike the Knight, is the star of the video. He gets the point across but keeps it light and humorous. Who doesn’t want to watch a school mascot decorate a gingerbread house? It is under 2 minutes. My attention never faltered. The video is appropriate for any audience. Viewers are treated to many notable locations on campus as Mike the Knight goes about bringing Christmas cheer to students, faculty, and staff. Alumni will enjoy seeing familiar places and prospective students get an idea of what campus looks like. It’s my alma mater. I’m partial. Have you seen any holiday cards that have impressed you this year? Note: I am a regular contributor to mStoner’s blog. This is a cross-post from my recent entry there. 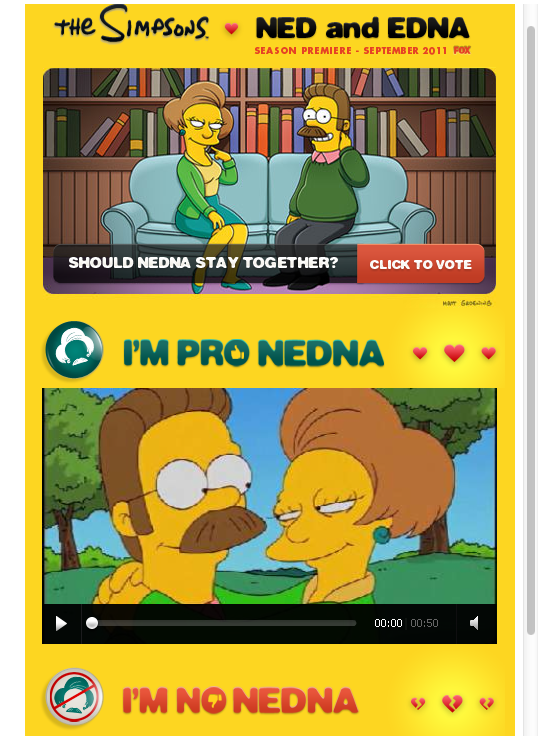 To gear up for the fall season premiere, the Simpsons asked viewers to vote on whether or not Ned and Edna (Nedna) should stay together. Who doesn’t enjoy sharing their opinion? Fun and interactive, this is something that will engage a casual viewer to the most passionate fans of the show. How could this apply to .edu? Research continues to show that your constituents enjoy viewing web video. The 2011 E-Expectations Report from Noel-Levitz highlights that the majority of prospective students and their parents will watch videos about your institution if they are considering you. Comscore reports that in August Facebook was the third most popular site for unique video views. Is your campus holding a contest? Maybe you are searching for a new mascot or elections for student body president are coming up. Taking the Nedna-approach you can showcase the options with video and then let the students vote. Many institutions host video contests, asking students to submit videos highlighting their favorite place on campus. Have you thought about letting students vote on the winner? Put the top three videos on a Facebook tab and let the students decide. Have you experimented with video in a Facebook tab? Leave a comment and share your example. Next up: Online shopping goes social. A new trend in higher ed video? The creation of funny and light-hearted college and university promotional videos has been on the rise ever since UQAM published their lip dub to “I Gotta Feelin'” exactly two years ago. Since then there have been flash mobs, 16 minute musicals, spoofs on those 16 minute musicals, strange British attempts to be funny, oh and of course… more lip dubs. I’m a little sick of flash mobs and lip dubs (and still waiting for the unflash mob to appear) but one style of video that I really enjoy are the music videos that are being produced by both institutions and students. Chances are you know by now that one of my favorites is Midd Kid (completely student produced!) but I also enjoy Call Me a Duck from the University of Oregon, a well produced video created to engage an eager audience who learned about the group On The Rocks from NBC’s The Sing Off. While at St. Mike’s I ran a video contest for students and received two music video entries Knight Vision and the contest winner At Saint Michael’s, proving to me that these videos are of interest to the 18-24 year old range. A few weeks ago I received an email from Joe Schuberth, associate director of undergraduate marketing at Towson University, asking me what I thought of a new music video he produced with students called I Tell ‘Em Towson University. My response? “HOLY CRAP THIS IS AWESOME!” Although, I think I toned it down a bit for my email reply. Where did the idea for “I Tell ’em” originate? Were you inspired by other institution’s music videos? I wanted to do a music video since I started working for Towson a little over three years ago. If they are done well, they are effective at getting tons of people talking and excited for an organization. With so many students using social media, I knew a music video had the potential to explode and reach both people who were considering Towson University and those who might not initially have Towson on their radar. I’ve seen “That’s Why I Chose Yale,” but I wanted to do something different. I wanted it to be from the students so it felt genuine and original. It took three years for it all to come together because I needed the right mix of talented students, and I finally found them during the winter of 2011. What was your process? You mentioned working with students, how did you discover their interest in doing such a project and what steps did you take with them to produce the video? I manage a YouTube channel, which features videos filmed and edited by Towson students. I hired Henry Basta to be part of the student YouTube crew in the fall of 2010 after an impressive interview and viewing some of his work which included a music video he and his friend, Jay Karolenko, produced for a video contest held by the library on campus. After working with and getting to know Henry for a semester, I was even more impressed with his creativity, attention to detail and his zeal for Towson. I knew Henry and Jay made up the band, Sharpened Crayons, and I started watching more of their videos on YouTube. Search them yourself, you won’t be disappointed. I started realizing that I had an opportunity to work with them and the rest of our student YouTube crew to make the music video I had been talking about for years. At the beginning of the spring semester, I brought Henry and Jay in to talk over the idea with them. They were thrilled with the opportunity and we immediately started throwing out ideas. We met almost every week for the entire spring semester. We started with the song. A music video will go nowhere without a well-produced song. I gave them some guidelines of things that I wanted them to cover, but I really wanted this to be something that came from them as students of Towson University, so I left most if it up to them. They came back with lyrics, we made some tweaks, and then they added the music to it. I loved what they did with the music. I have no musical talent whatsoever, but I do think I know a good song when I hear it, and when I heard their first cut of this song, I knew we were going to be doing something big. I couldn’t get the song out of my head! After the song was finalized, we started planning out all our shots. I also wanted the video to be a quick tour of Towson for anyone who watched it, so I knew we had to have lots of different shots and involve lots of different people all over campus. We all worked to set up all the shots and made sure we could do things like have a dance party underwater with the women’s swim team or in the middle of a dining hall. We wanted the ending to be our grand finale, so we spent a lot of time planning that out and getting some of our students, cheerleaders and marching band to participate, as well as our mascot, Doc the Tiger. All of the student YouTube Crew, including Henry and Jay, played a part in figuring out the right camera angles and techniques for all the shots, especially the ending. Chad Harrell was the main videographer for most of the shots, and Alex Nearey and Steven Wilson also played roles in filming. I was really blessed with excellent student talent around me to be able to pull all this off. After we got all the footage, Henry edited it together. I gave him some feedback and so did some of the other members of the YouTube Crew our other students, Henry made some changes, and we finally had a music video after four months. Why did you choose to invest time in a fun promo video? What are your aims and objectives? Our students are some of the best people to tell the story of why a prospective student should come to Towson University, so when I saw this opportunity coming together, I had to take it. The main goal of the video is to increase excitement for Towson University and ultimately bring in more students who want to become Towson Tigers. How will you be promoting this video? We are promoting the video through e-mail and our website, and it is the featured video on our YouTube channel. We will be showing it during our campus tours and our Open House events. The Towson community liked it so much that we had a request for it to be played on the television screens in our University Union, so it now plays on a loop there too. What will constitute success with this project? How are you measuring results? Measuring results is a challenge with something like this because you will never truly know how many people were affected by the video. But we will do our best to measure results by including a question about the music video in the surveys we conduct with our prospective students. Hopefully this will tell us whether or not the music video played a factor in their decision on whether or not to attend Towson University. We can also obviously measure views. We’d like to have at least 50,000 views within a year of releasing the video. We are on our way with 28,547 views so far as of 9/8/11. The comments on YouTube have been a nice sign of success too. Alumni, current students and prospective students have all been commenting on the video with lots of excitement and pride for the school, which is exactly what we wanted. Watch the video for yourself! What do you think about this new trend in higher ed videos? Leave a comment and let me know. YouTube Reactions, a new way for viewers to respond and interact with videos, is a service YouTube started testing this summer. Today it appears they have rolled out Reactions to all videos and made it’s location more prominent. Here is a screen shot where you can see the call out to “Your Reaction?” at the bottom right. Unfortunately you have to be signed in to participate in this feature, which is really too bad. The very definition of “reaction” indicates a certain level of spontaneity that seems undermined by having to take an extra step. The most popular videos on YouTube (think Bed Intruder, Sneezing Panda, and Evolution of Dance) all have less than 100 Reactions thus far. Yes, the feature is new, but if these videos can’t get traction with Reactions… will yours? Some videos will fit into more than just one of these categories. 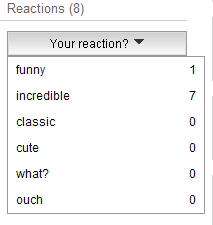 In my example above I would like to select funny and incredible. YouTube is forcing me to choose. Give me check-boxes instead so I can express exactly how I feel. And what about a video that doesn’t fit into any of these 6 choices? Will this get measured? As pointed out in the article linked above, will we eventually be able to sort videos based on “funny” or “what?” Will this voting system be integrated into Insights? I’m interested to see how this feature continues to evolve and whether or not viewers choose to use it. What do you think? Will you use YouTube Reactions? Think about your web presence and not just your web site. 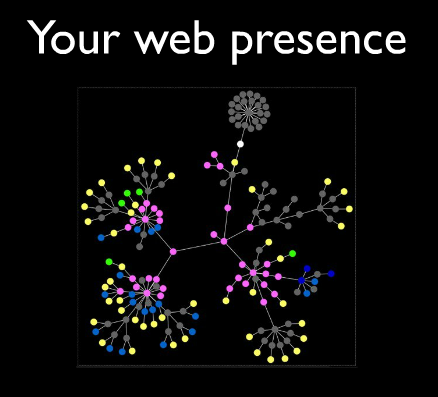 Your web presence is anywhere, anytime. Your audience interacts with content. Are you spending your time wisely to create the content they need and want? How can you know what that type of content is? The 2011 E-Expectations Report can help guide you. This report surveyed 1045 students and 517 parents from across the USA to find out what their online expectations are during the college search. If you work in Admissions or do recruitment-focused marketing, this report is a must read. While I strongly encourage you to read the report for yourself (and perhaps even print it out and go through with a highlighter!) I have pulled out what I believe are three key findings and my reactions to them. This number is up 13% from last year’s survey. Also, 27% of students report that they visit other video sites (like YouTube) to look at schools on their list, up 17% from last year. What type of videos are they seeking? Nearly half of respondents report that student life-related videos are most interesting. These are videos that highlight on-campus activities and events and simply give prospects a sense of what it is like to be a member of your college community. These videos are typically short, fun, easy to watch, and feature current students. In fact, E-Expectations reports that 1 in 5 students will actually drop a school from consideration. This alarming statistic makes me want to immediately do user testing on my institution’s website to make sure that information is easily found and the content is useful and interesting. The report did not ask students what they considered to be a “negative experience” but we know that for many prospective families the website is their first “visit” to your college. How much time is spent training student ambassadors and admission staff with the goal of portraying an exciting and positive (yet accurate!) account of the school? That time will be wasted if students are writing off your institution before they even show up. The report also found that both students and parents are first clicking on academic programs or admission information. If you are trying to decide where to spend your dollars and/or time beefing up your site, doesn’t it make sense to start there? While 80% of students surveyed have a Facebook account, only 27% have viewed a college Facebook page and nearly 2/3 of that population say the experience had no influence on their decision. Well this was a bit disheartening, I will admit. You’ll be hard pressed to find a college that is not putting time and effort into developing a Facebook presence. Many schools find that accepted and enrolled students are more likely to join a “Class of” Page or Group. These students are interested in connecting with each other at that point. A recent post on .eduGuru examined community-building on both Pages and Groups that you may find helpful. SUNY Plattsburgh makes excellent use of tabs on their Facebook Page to bring all of their audiences together under one roof. Tim Nekritz at SUNY Oswego expressed his belief on having just one Page to rule your various audiences back in January. When it comes to re-evaluating your web presence, this report will give you a jump start. However, you may find yourself scratching your head at some of the findings. Your audience of prospective students may behave differently than those surveyed, which is why it is important to collect and pay attention to your own metrics. For example, E-Expectations found that only 1 in 4 students review blogs. I know (because we ask them) that 2 in 3 enrolled students use SMCBlogs as a tool to help them learn more about Saint Michael’s College, but our audience and the type of student we attract is very different than other institutions – especially big state schools! There are many more compelling and important results to this survey that I did not discuss in this post. Here is a Storify compiled by Mike Petroff on the findings he found to be important. What results of this report did you find particularly interesting? Please share your thoughts below. I received this in my inbox recently from “The YouTube Team” regarding my pending (of nearly a year) YouTube EDU application. Thank you for applying to YouTube EDU, home to high quality educational content from around the world! Our vision is to provide a vibrant, global platform where anyone, anywhere can obtain a world-class education. Whether you are a student, teacher, or gifted storyteller, our hope is that you will continually discover, create, and share educational videos with the world. To reach this vision, we are currently revamping YouTube EDU to bring you a bigger and better version of what you’ve seen to date. …we do invite you to consider applying for the YouTube Partner Program, which enables access to features such as premium branding capabilities, ability to upload longform high quality video, and advanced analytics. You can apply for the YouTube Partner Program at: http://www.youtube.com/partners. To learn more about Google education resources, check out http://www.google.com/edu. To make the most of your YouTube experience, visit YouTube Essentials: http://www.youtube.com/t/about_essentials. Again, thank you for your interest and we appreciate your understanding as we work to achieve our vision! I’ve since learned that in the past the requirement for EDU status was to have a ‘representative amount of educational content’ on your channel, which typically meant at least 50 videos, of which some are full courses (e.g. lecture 1-20 of an entire course). I’ll be very interested to see how YouTube goes about revamping their EDU site. Will the requirements change? Will current EDU partners be ushered into the “new” system, even if their current content doesn’t meet the old requirements? There is lots of talk about Commencement 2.0 and how we incorporate a social experience into the day. Are you worried that your school can’t keep up? Were the higher-ups not interested in live-streaming your hashtag on the dias? Don’t freak out, I can guarantee you are not alone. If you do nothing else: make sure that someone is filming the big parts of the day, getting impromptu interviews with graduates, and has plenty of backup batteries in their pocket! The footage that you capture from Commencement can create multiple short videos that focus on a recap of the day, messages to the graduates, how the seniors are feeling, and more. They will be viewed, I promise. But the trick is getting the videos up within 24 hours. Trust me, this is when your proud new alumni will be most interested in re-living their big day. And if you’re lucky… you might just wind up with a marriage proposal. Last night’s episode of Higher Ed Live was chock-full of YouTube pro tips from Seth Odell. Any business or higher ed institution who uses YouTube to share web video needs to know the following 10 tricks in order to get more bang for your buck. Video Pro Tip #1 – Always post your video initially as private or unlisted. Even once YouTube has finished uploaded your video, it takes awhile for it to process. A processing video usually looks like crap… not what you want your customers to be watching! Allow for the video to process (the length of time varies) and then make your video public once it is completed. Video Pro Tip #2 – Thumbnails are important. As a YouTube partner you can customize your thumbnails. Thumbnails lure viewers to click on your video. Higher Ed institutions can become an EDU partner (bonus tip: in order to do this you must have quality academic content on your channel, not just promo videos) and upload customized thumbnails. I recall seeing stats somewhere in my internet searching equating a well-chosen thumbnail to higher viewership. Video Pro Tip #3 – To hyperlink in the video description box, make sure to include the “http://&#8221;. Do not start links with “www.” in the description box as they will not be hyperlinked. This is important to remember if you want to drive viewers back to your website. Video Pro Tip #4 – You can link to a specific time in a video with the code #t=00M00S. Ever wanted to direct blog readers to a certain moment in a YouTube video? Add the above code to the end of the video URL and replace with zero’s with the time in the video that you want them to see. Video Pro Tip #5 – YouTube does not weight your video titles as much as it weights your file name. If you are like me, you are careful to tag your videos appropriately so they show up in searches. A little known fact is that YouTube places more weight on the original file name of your video than the title that you later give it. When exporting your video from iMovie, Final Cut Pro, etc. make sure to properly title the file. YouTube is the 2nd largest search engine in the world and I can imagine you want to make sure you’re optimizing YouTube SEO. Video Pro Tip #6 – Use the YouTube Keyword tool to find trends and help optimize YouTube SEO. This free YouTube Keyword tool will help you capitalize on current trends on the web. You can even sort keyword suggestions by country, language, demographic, and interests. Video Pro Tip #7 – “Best” the YouTube algorithm with proper file names and creating your own co-view web. If you are interested in your videos appearing in the “suggestions” column (and let’s be honest, who isn’t?) you can attempt to “best” the YouTube algorithm by combining Pro Tip #5 with some careful clicking. Seth Odell admits this is a time-consuming process: start on your own video and click on a suggested video that is not your own. Spend time clicking around on the next set of suggested videos and inserting your own URL ever so often. YouTube makes it’s “suggestions” by remembering the web of videos that viewers watch. You can essentially create your own co-view web… if you have the time. Video Pro Tip #8 – There are only 3 ways people find your videos: Directed, Direct Search, Indirect Search/Browser. Video Pro Tip #9 – Use YouTube annotations to drive viewers to your own videos. At the end of every video you create, place a 10 second screen that has text to the effect of “Click here for more videos from Company X.” Use YouTube annotations to link the text to your YouTube channel. Wouldn’t you rather your viewers watching more of your videos versus leaving your channel for a suggestion? Video Pro Tip #10- Hotspots tell you when viewership drops off, this is only available for videos under 1 year old. Understand your viewers better by paying attention to YouTube Insights, particularly the hotspots. This will help you catch viewership trends on your videos. BONUS! Want the latest stats on web video? ComScore, Inc. is my favorite resource and they recently released “The State of Online Video.” The presentation and slides from Dan Piech, Senior Product Management Analyst, can be found here. Watch Episode 17 “Seriously Advanced YouTube Tips” with Seth Odell of Higher Ed Live. What is a viral video? After realizing today that I had not listened to the Midd Kid rap video in far too long (it’s been at least a month), I also realized it was time to update my blog readers on the status of Midd Kid vs. Yale. In a blog post from November 2010, I recapped my HighEd Web conference session “Using YouTube for Recruitment.” I ended my presentation with the question, “What makes a video viral?” I showed screenshots from the videos “That’s Why I Chose Yale” (YouTube musical from the Yale admission office) and “Midd Kid” (student produced rap video at Middlebury College) and asked the audience to raise their hand if they could recognize what video the screenshot was from. While many of the attendees had heard of the “Yale” video, only one attendee had ever seen “Midd Kid,” and he was from Vermont so he didn’t count. Now, this was despite the fact that the videos were released roughly one month apart and “Midd Kid” had over 11,000 more views than “Yale.” My point was that a video can not be considered viral solely based on the number of views it has received. One needs to ask “Who is my target market?” and “Did the video reach them?” According to YouTube’s Insights, at the time of the presentation, the top 3 audiences for “Yale” was Females 13-17 and Females and Males 45-54. The top 3 audiences for “Midd Kid” was Females 13-17, Males 18-24, and Males 25-34. Today “Midd Kid” is outpacing “Yale” by almost 58,000 views and the top 3 audiences for each video haven’t changed. It’s important to note that “Midd Kid” did not have the extraordinary amount of press coverage that “Yale” received when it was released. Yale disabled the ability to add comments on their video. (Side note: I’m not a fan of that.) 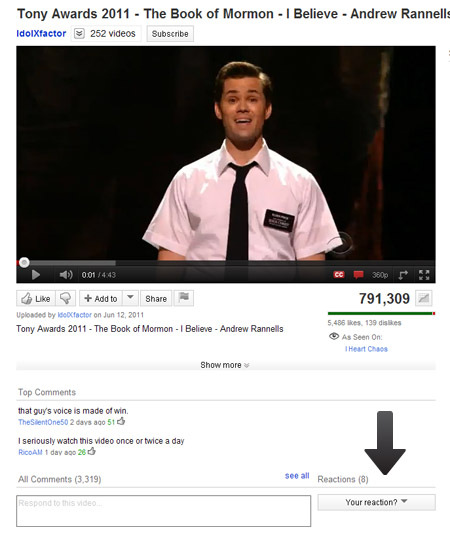 But, here’s a screenshot of the top two comments for “Midd Kid.” I think the 2nd one is particularly striking. “This has probably made more people want to go to Middlebury than all the college’s recruiting efforts combined.” Walee227, you are one insightful dude. What do you think? Is “Midd Kid” a viral video?… even though you may never have heard of it until today. Is “Yale” a viral video?… even though it isn’t fully reaching it’s target market? Weigh in with your thoughts in the comments. “Midd Kid” surpassed 1 million views while “Yale” continues to lag behind with roughly 925,000 views.